As part of the 200 Churches Program approved by the Russian Orthodox Church two years ago, eight new churches have already been built in five districts of Moscow. Thirteen more are under construction, and the documentation for a future 36 churches has been completed. Patriarch Kirill announced in the summer of 2010 that the Russian Orthodox Church would need to build at least 200 new churches. He based his argument on the numbers: If, in Russia overall, there is one church for every 11,000–13,000 residents, then, in Moscow, (where there are only 650 churches and chapels) every place of worship must accommodate two or three times as many people. Many see the realization of the 200 Churches Program as the ideological expansion of the Russian Orthodox Church; even some Orthodox believers are disturbed by it. Most disgruntled of all by this program are people who live in the districts where the new churches are being built or will be built. In principle, they are not against this sort of construction, but they say that more thought should be put into choosing the sites — parks and squares should be left untouched. 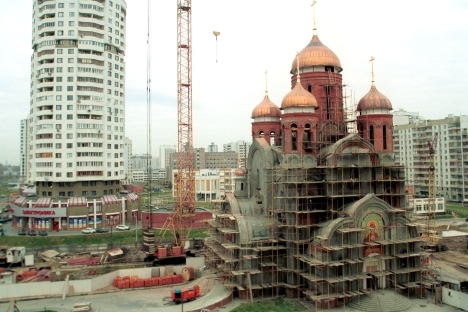 Meanwhile, many Muscovites cannot understand why new Orthodox churches have to be built at all. They say that the churches near them are largely deserted, even during important Orthodox holidays. In their opinion, it would be far more logical for the Russian Orthodox Church to spend its money on shelters for the homeless. The trickiest aspect of implementing the 200 Churches Program is the privileged position that municipal authorities have accorded the interests of the Orthodox Church. Despite statements to the effect that Moscow is a multi-denominational city, other religious groups have few churches of their own. The Catholic Church has two churches and 12 parishes. The Jewish faith has five synagogues; Muslims have four mosques and Lutherans have three churches. Experts agree that the question of building new mosques is most pressing of all. Some 2 million Muslims live in Moscow. Last year, the United Center of Muslim Organizations in Russia finally received permission to build a new mosque. However, residents of the district in which the construction was planned came out against the project and it was dropped. The Moscow population mostly approves of such conclusions. Experts, on the other hand, say that the numbers of Muslims in Moscow will not diminish due to the lack of mosques. Meanwhile, relations between the different nationalities are becoming worse and worse with every passing year. “Muscovites have become hostages to their phobias with respect to Muslims,” said Abdul-Vakhed Niyazov, president of the Islamic Cultural Center of Russia, in response to an earlier, unsuccessful bid to build a mosque in the Moscow district of Mitino. Other religious groups are also dissatisfied. The Federation of Jewish Communities of Russia has informed the municipal authorities many times of the need to build several more synagogues in addition to the existing five. No new synagogues are being built, even though Russian President Vladimir Putin opened the world’s largest museum of Jewish history in 2012. Small religious sects, too, have their complaints. Krishna worshippers, for example, have been trying for almost a decade to replace the loss of the building which, since 1991, had been their only temple in Moscow. It was razed in 2004. Despite the active support of foreign politicians and cultural leaders, construction of a new Krishna temple has yet to begin. As for the construction of Orthodox churches, residents’ protests have not gone entirely unheard. So far, at 19 hearings concerning the 200 Churches Program, the protesters have managed to win negative decisions. Meanwhile, the municipal authorities have given the Russian Orthodox Church twice as many new sites from which to choose. The article is abridged and first published in Russian in Kommersant-Dengi magazine.